Light sources produce infra-red radiation, perceived as heat. Its amount depends on the type of lamp used. Any object under direct light is therefore subject to constant thermal stress, which can change its properties. In food stores, clothes shops, pharmaceutical labs the production of IR radiation is usually not desirable. A classic source of IR radiation is incandescent lamp, a notably inefficient light source where only 5 percent of energy is turned into light. High pressure sodium lamps, although more efficient, still turn as much as 70 percent of energy into heat, the rest is visible light. 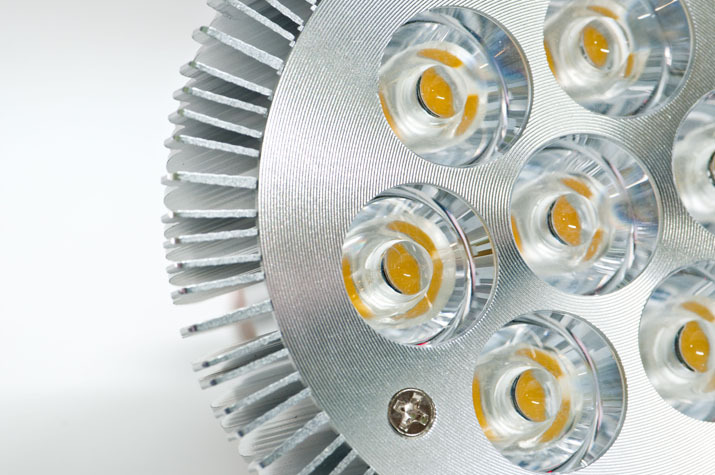 LEDs are the only light source where heat production is negligible. The visible light spectrum is found between ultra-violet (UV) and infra-red (IR) radiation, infra-red being the one with lower frequency. People do not see infra-red wavelengths, but they do perceive it nonetheless in the form of radiant heat. Light sources produce IR radiation, the amount depending on the type of lamp. Any object under direct light is therefore subject to constant thermal stress, which can change its properties. Sometimes it is a useful feature: strong IR radiators are used in restaurants to keep the food from getting cold for example. A classic source of IR radiation is incandescent lamp, a notably inefficient light source where only 5 percent of energy is turned into light. High pressure sodium lamps, although more efficient, still turn as much as 70 percent of energy into heat, the rest is visible light. The rest is radiated as heat, making this obsolete light source a health hazard if it can be easily reached and touched. In food stores, clothes shops, pharmaceutical labs the production of IR radiation is usually not desirable and can aid deterioration of goods on offer. Some foods can even be irreversibly destroyed under high radiant heat. For these purposes the new LED technologies can provide light sources of choice due to their minimum IR radiation. It can be said that LED is the only light source that does not negatively affect the qualities of the goods it is illuminating. High volumes of radiant heat mean another problem to tackle: if luminaires or light sources are used in a closed area the produced heat has to be funnelled out to keep the temperature from increasing. This means higher demands on air conditioning, which itself requires substantial energy consumption. With lighting systems that utilize heat-producing lamps energy costs are high both due to inefficient light sources and the higher load for air conditioning. Not to mention irreparable damage to goods staying too close to a radiant heat source, thus lowering the revenues in retail spaces. For the purposes of LQS the proportion of IR radiation is assessed across all light sources used and average is made. The amount if IR radiation can be found in documents available from lamp producers. The lower the average proportion of the IR radiation, the better is the mark in LQS. The top marks are given to proportion of IR radiation below 15 percent – a domain of LED-only solutions. The systems with IR radiation share of over 60 percent receive 0 points, showing the wasteful nature of incandescent and many fluorescent lamps.